Full transparency in digital media for a very long time has been an elephant in the room, and today it's made as a focal topic in conversation. As marketers are pushing for greater transparency in the hazy world of digital ad buying, new approaches are being put in place in order to create an honest and controlled balance between the digital buyer and seller. The relationship between publisher, advertiser and agencies will be or if not already, heading towards decision-making based on the understanding that advertisers know exactly what they are paying for, with meaningful metrics, clear return on investment and how brand safety is being addressed. The world of digital media has focused on this pressing issue in which most marketers face today. In this article we will talk about what transparency means for you and how to apply it to your brand. Online advertising has been around for a fairly short period of time compared to other forms of traditional media such as print. The first digital ad kicked off in the early 90s, with print advertising first seen over 300 years ago. In this time, print has had its time to evolve and develop, while digital is still trying to catch its footing. For digital media, ad buying is changing, with new metrics added to the mix as the advertising landscape evolves. This can be a major challenge to communicate to clients, especially to those who may not be fluent with the ad tech lingo. Image: First ever digital banner by HotWires part of Wires magazine, unleashed its banner onto the information superhighway in 1994. Metrics such as CPM, CTR and CPA are probably the quickest and most productive conversations in getting results to clients, however, the focus should dive much deeper into granular details regarding reach, engagement, and overall impact the campaign is having on the purchase funnel. The biggest problem with digital advertising is the lack of transparency. Whether it be the difficulty disseminating the information clients see or the lack of access to performance data provided by the publisher to the brand. Understanding what transparency means and why it's imperative in digital advertising, we must first recognise who exactly makes up the internet. Majority of content consumed online is a result of partnerships between the brands (who hold the budget), agencies (who own much of the strategy and creative) and the publishers (who sell exposure to their audiences). The exchange of information can sometimes be misinterpreted with brands not getting the entire story, and lack of transparency reflected in the reporting, resulting in tension and dishonesty. Issues surrounding digital transparency caught the spotlight with brands holding back on their spend for programmatic ads that were risked placed next to offensive content across networks such as YouTube and Google's display. Facebook also faced some backlash after providing it's advertisers with false metrics by exaggerating the results. Because of the measurement inaccuracies, Facebook took action and pledges to be more open as a result. For a business to be transparent, its about being open about things such as price, guarantees and acknowledging mistakes. Being transparent about the cost of a campaign, what they'll get in return and how they can get there. Transparency is a crucial factor that will make a dramatic impact to any business, because let's face it, who can trust a company that doesn't disclose information. There are very few ways to build trust, but the key is to be transparent. For Advertisers, transparency allows for better control and campaign management of how much is invested in the ad itself. Full visibility into real-time performance means advertisers can exercise changes over the campaign duration. With in-depth analytics on campaign performance, advertisers can optimise creative and media in a more efficient and effective way, including scaling up spend with their publisher. In addition, campaigns that are failing to deliver results can be instantly removed. With full transparency of results, ensures that overall campaign performance continues to improve instead of fall over time and advertiser's will gain a stronger return on ad spend. The buying and selling of ads have changed dramatically since the early days of digital advertising. Initially, advertiser or ad agencies would purchase advertising spots directly from the publisher. Nowadays, there are a series of middlemen including ad networks, which buy excess inventory from publishers and sell it to buyers, and ad exchanges, which link publishers to ad networks and advertisers and provide a platform for automated (programmatic) and real-time ad purchasing. Creating an environment based on transparency like JARVIS, advertisers can see exactly where their ads are running along with the type of audience seeing the ad and the return on spend. Data ingested in real-time gives advertisers the stepping stone to make changes and adjustments. Vanity metrics like CTR and CPM is what everyone talks about which can sometimes be misleading and doesn't give clients the full scope of how the campaign is performing. A more effective strategy is to firmly establish meaningful performance indicators for each campaign and direct them towards metrics that pertain to these goals. After that's completed you can start conducting transparent reviews of important performance metrics such as viewable impressions and site placements. Access to performance metrics that are made available for all parties to access at any time, there is a solution for full transparency. Ensuring campaigns stay on track, helping clients better understand exactly what's going on with their campaigns. Rather than pulling out information and compiling weekly or monthly reporting to clients, real-time dashboards will boost alignment and ensure everyone part of the campaign is always in the loop. Image: JARVIS real-time campaign dashboard allows for better transparency across any of your campaigns. Ongoing communication on campaign performance, both good and bad - fosters the relationship between the publisher and brand. When both parties are aware of goals, placements, and performance, there will never be any surprises. When transparency becomes a top priority, everyone part of the campaign will have a better understanding of the goals and work toward them. Transparency is the key to ensuring that your getting the most out of your campaign including where your spend is going, whom your campaign is targeted towards. 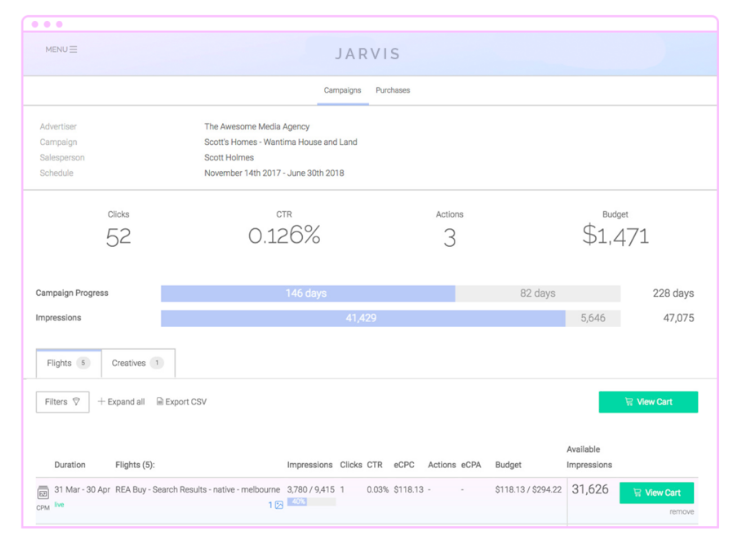 To find out how you can apply real-time dashboards to your brand take a look at JARVIS for Digital.